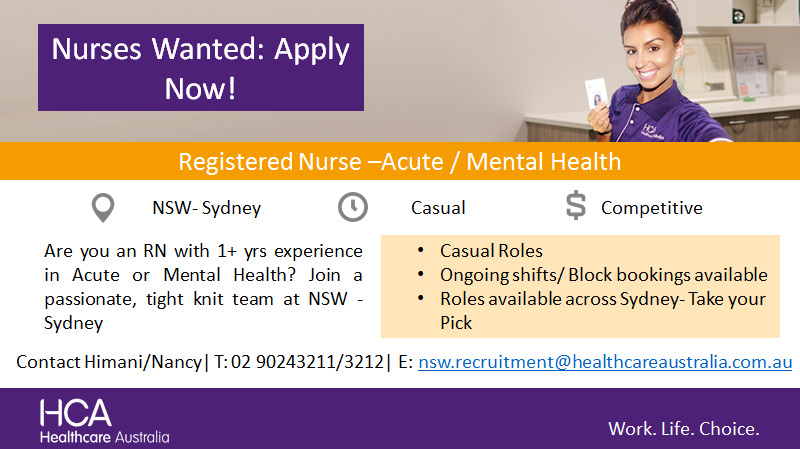 We are looking for experienced Mental Health or Acute Care Registered Nurses to join our Agency and work for hospitals within the local Sydney area. Large amount of shifts available for experienced Registered Nurses to book in each week with our Agency and also be given the flexibility of choosing the days you want to work. You will be responsible for providing a high level of patient care and have the opportunity to work in the major hospitals around Sydney. Healthcare Australia ‘HCA’ is a specialist healthcare staffing and workforce management company, providing agency staffing recruitment services, workforce management solutions, vocational training and continuing professional development courses. We are proud to play an active role in our nation’s health and wellbeing as we touch the lives of over 35,000 Aussies every day.